Do you ever eat out, order something, and then love it so much that you want to try making it at home? I know this feeling all too well. I always love trying to make restaurant meals back home. This is what happened when my husband and I ate out with some friends in the city last week. I ordered a quesadilla and fell in love with the flavors in it, which is why I wanted to attempt my own version. It’s a wrap, not a quesadilla, but besides that it is almost spot on from what I devoured in the restaurant! Here, I have for you, what I have named the Sweet Potato BBQ Wrap. 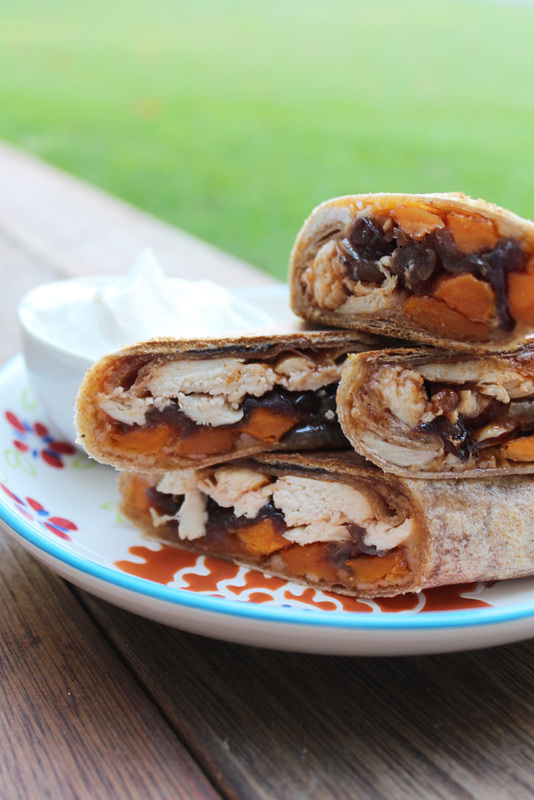 This Sweet Potato BBQ Wrap has flavors that merry perfectly together. There is a natural sweetness that comes from the sweet potato fries and, surprisingly, the red onions. My husband taught me how to caramelize red onions and it was much simpler than I imagined. Basically, if you cook the red onions long enough on low heat, the water content is removed and the natural sugars stay. And, best of all, that pungent red onion breath that we all know seems to stay away! We’re in love with this wrap. Definitely the first of many. 1. Cook sweet potato fries according to directions on the bag. 2. In a sauce pan add olive oil and red onion, and sprinkle the sugar on and let cook for 20-30 minutes. Stir occasionally. 3. Time to arrange! 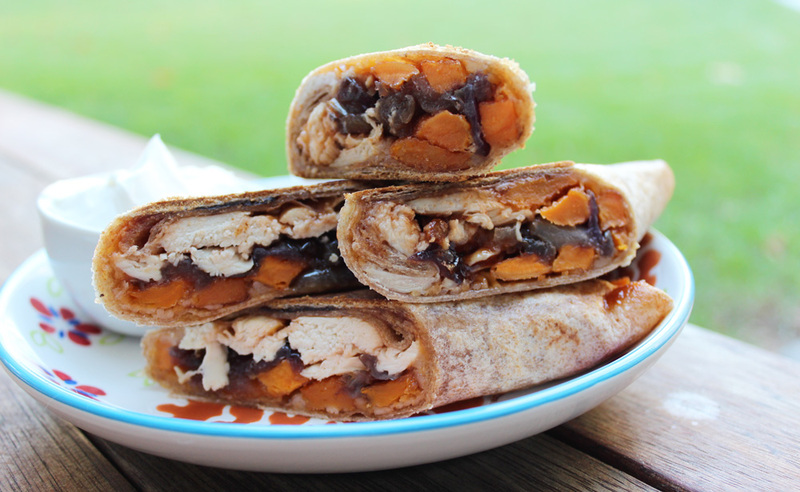 On the wrap, add the cheese, chicken, sweet potato fries, caramelized onions, and BBQ sauce. 4. Wrap it up and place on a griddle to seal the opening close. Enjoy with some sour cream on the side!